Jean Bosco is a farmer. Just north of Congo’s capital city of Brazzaville, fields bear the mark of his honest labor – hectares of cassava, gardens of blooming eggplant and tomato, and lime and mango trees providing welcoming shade from the African sun. Jean and his wife, Carine, worked hard to enjoy life with their six children. They enjoyed simple prosperity and stability . . . until a mysterious growth appeared on Jean’s back in 2003. What Jean calls his maladie was, in fact, a lipoma – a benign, soft-tissue tumor composed of body fat. Left untreated, a lipoma can reach giant proportions. Jean explains: “When my malady started, it was barely noticeable. But after three years, it began to rise from my shoulders. I became afraid; if I were to die, my family would suffer greatly,” Jean said. 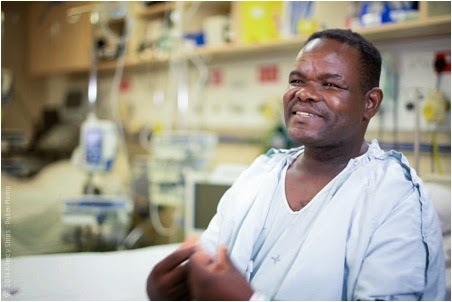 Driven by concern for the well-being of his wife and children, Jean saved enough money for a hospital visit in 2009. But the appointments, bloodwork, and medicine quickly emptied his pockets, and he had to return home without surgery. Help arrived in God’s creative, unusual way. In 2013, Jean’s lipoma ruptured and began to bleed. 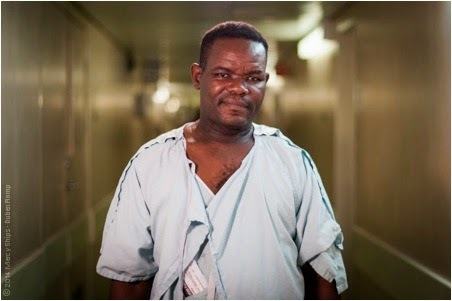 He had no choice but to seek emergency medical care in Brazzaville. He found himself once again on the doorstep of surgery but without the means to pay for it. 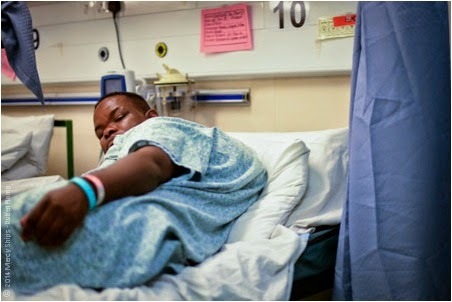 While in the city, he learned of a hospital ship docked in the Congo. 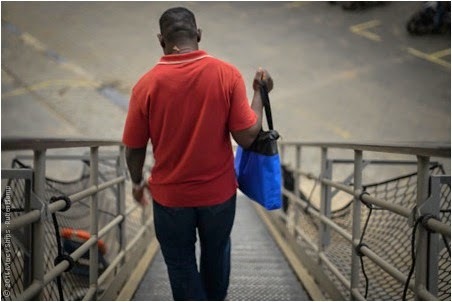 “Go to Mercy Ships,” a friend told him. “The surgeons will help you for free.” Jean was amazed, and he wasted no time in traveling to the coastal city of Pointe Noire. 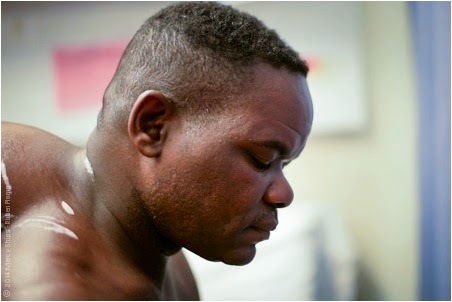 By the time Jean boarded the Africa Mercy, the watermelon-shaped lipoma protruding from his back weighed 20 pounds! Even in extreme cases, a lipoma usually reaches only 8 to 11 pounds. Under the expert hands of South African volunteer Dr. Tertius Venter, the massive lipoma was removed in a two-hour surgery. Jean’s smile and easygoing nature reflect a satisfaction with his life’s work and his faith. Now, with the free gift of surgery, he will be better able to care for his farm and his family. The day of Jean’s surgery has arrived. “Since 2003, while I had this tumor, I could not lie down or sleep on my back, ever.” He is eager for that to change. The watermelon-shaped lipoma growing from Jean’s back weighed an amazing 20 pounds! The majority of extreme lipoma cases typically reach 8 to 11 pounds. “Because it was so big, it always bothered me. I could not work hard, as it would exhaust me too quickly. I have always been good at keeping the welfare of my family in equilibrium, but my malady made our lives very difficult,” Jean says. Jean’s surgery and healing has been miraculously swift, and Jean is eager to get home: “My family is so excited to see me now. There is a very perfect joy that is waiting for me and mine at home,” Jean says in an interview on his last day in the hospital. Clem, the Communications Team Translator, spends some time with Jean before he leaves. 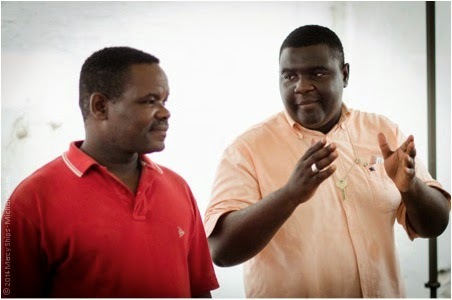 The two Congolese formed a great friendship while Jean was onboard the Africa Mercy. “When I arrived in Pointe Noire a few weeks ago, I crossed paths with a policeman on the street. He took one look at my back and asked me where I was headed. 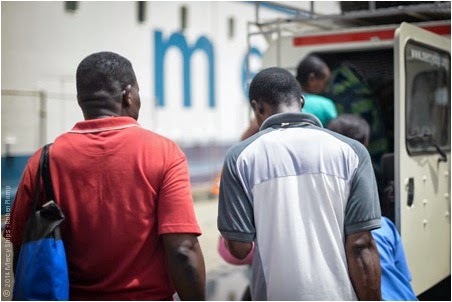 I told him, ’to the Mercy Ships.’ He smiled and told me, ‘You are in good hands there, my friend.’” Today, as a healed Jean leaves the hospital, it is plain to see that the policeman was right. Story by our Communications Team"